On May 17th, we had our 1st Annual Kathryn Bender Memorial Dance Showcase at College of DuPage. It was a very successful event with attendance reaching close to 500! This event was not an ordinary dance showcase.The audience was entertained with much more than what they saw on stage. The lobby was filled with entertainment. There were flowers and DVD's to buy, food to eat and raffles to be won. The flowers were beautiful roses which were being purchased not only for the dancers performing, but for anyone who has touched a life in a positive way. DVD's of the showcase were also available. There are two tributes in honor of Kathryn that are included on the DVD. There are 5 copies left of the DVD so if you would like to purchase one please visit our website. On a long table, in the center of the lobby, sat 26 raffle baskets filled with great prizes. Each basket was worth $60 to $300! There were baskets that included everything from autographed pointe shoes from the Joffery Ballet to White Sox tickets. Everyone was a winner in this raffle because even if you only purchased one ticket you received a memorial bracelet in remembrance of Kathryn. Many pictures of the showcase can be viewed on our website. Please take a moment to look through them and witness the outpouring of support that took place to make this first showcase a success! Next year is only expected to be bigger and better than this year. Mark your calendars now...next years showcase will be held on Tuesday May 15, 2007. Naperville North recognized Kathryn in several different ways during the end of this past school year. Some of these include a senior scholarship, the establishment of a new mural that will be located in the building and a special tribute to Kathryn in this years commencement ceremony. KBMF has started the "Kathryn Bender Performance Award," which is a scholarship that will be given to a graduating senior each year to assist them with college tuition. The recipient of this award demonstrates performance skills such as leadership and being a role model. Other qualifications include participation in school activities which could include everything from choir, band or orchestra to orchesis, drama club or first class. This years recipient was Jackie Trabilsy. Jackie will be going on to college to study theater and we wish her the best. To help display the "Kathryn Bender Performance Award" and its recipients, KBMF and Naperville North have worked together to have a mural established in the building. This mural, which will be painted by Timm Etters, will be started this summer. Please check our website for details on the unveiling of this mural. At this years commencement ceremony for the class of 2006, all of Kathryn's classmates had a purple ribbon pinned on their graduation gowns in remembrance of her. After principal Ross Truemper spoke a few words about Kathryn, there was a moment of silence to begin the ceremony. During the program both of the commencement speakers spoke of her in their speeches. Finally, in the back of the commencement program, Kathryn was honored once again with a beautiful poem entitled "Dream Big" by an unknown author. Thank you to Naperville North for all of your support these past months. The whole school has been like a part of our family. This past June at the Steps Dance Center yearly recital, two scholarships were given to dancers which display similar characteristics as Kathryn did. The first scholarship was awarded to a performing group member and entitled her to a year of paid tuition as Steps. Amanda Scherer was awarded this first "Kathryn Bender Performing Group Scholarship." The second scholarship was awarded to a high school senior dancer to assist her with college tuition. This years "Kathryn Bender Senior Scholarship" was awarded to Kim LaVelle. We would like to thank Amanda and Kim, who were sincere friends to Kathryn, for being such wonderful girls. Amanda and Kim's names have been engraved in a plaque which is on display at Steps Dance Center. "...two scholarships were given to dancers which display similar characteristics as Kathryn did." 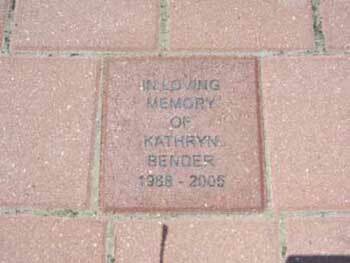 The next time you take a stroll downtown Naperville, be sure to visit Kathryn's brick. The brick, purchased by friends of Elizabeth Bender, was installed in May in the new section of the Naperville Riverwalk. It can be found on the northeast quadrant of the Fredenhagen fountain. The fountain is located on the east side of Washington Street just south of Chicago Avenue. Thank you to those who made this possible. It is a wonderful way to keep Kathryn's memory alive, not only for those who knew her, but for everyone who reads this beautifully engraved brick. Kathryn's elementary school is creating a mural for Kathryn on the outside, back wall of the building. A once white wall has been painted back to its natural brick color and a mural with prairie grass and butterflies has been started. With the help of Naper School's art teacher and good friend of the family, Leitha Walling, the mural is well on its way. The butterflies are being painted by family and friends of Kathryn. If you look closely at the mural, you will see that each butterfly has been created using the initials of the person who has painted them. Kathryn's cousin Jill and friend Rachel begin the mural. Kathryn's family begins to add their butterflies. All of Kathryn's family members and friends are invited to paint a butterfly on the wall. If you would like to paint a butterfly for Kathryn, please let us know or send us an e-mail under the Contact Us section of the website. Last school year, the staff at Beebe Elementary School began a wonderful tradition. Every Thursday, a staff member would bring a chocolate snack to share with their co-workers. "It gives us a little something to look forward to. Plus, who isn't happy when they get to eat chocolate?!" says staff member, Amy Tomney. 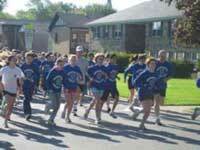 Amy thought of using this tradition to create a fundraiser for KBMF. By collecting all of these great recipes, Amy has created a chocolate cookbook entitled Chocolate Thursdays. Chocolate Thursdays will be available to order this fall. Order forms will be available on our website as well as in the next newsletter. 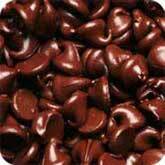 Get Ready Chocolate Lovers! This is something you will not want to miss! 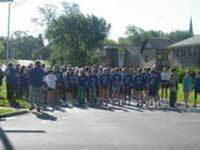 The 5K Walk/Run that was held by Washington Junior High in May was a great success with over 250 participants! Thank you to Washington for deciding to support us this year. With the help of the sponsors: Anderson's Bookshop, Braconi's Restaurant & Pizzeria, Naper Nuts & Sweets, Portillo's Hotdogs and Radon Reduction Systems, Inc. the event provided everyone who participated with a goody bag along with a full snack table and drinks for all to enjoy after their 5K trip! Because this year was so successful, we hope to continue this event annually. Please keep checking the website and we will keep you informed about the 2nd 5K Walk/Run for KBMF that will be held in the spring. Reminder: Please sign up to receive this newsletter via e-mail. This can be done under the Contact Us section of our website. www.kbmf.net Thank you!